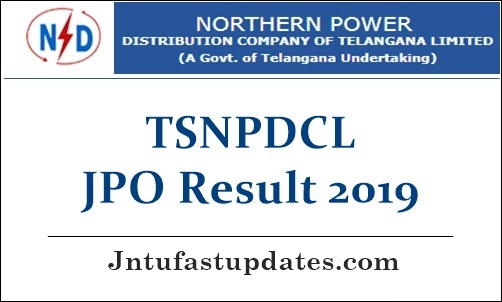 TSNPDCL JPO Results 2019: Telangana State Northern Power Distribution Company Limited (TSNPDCL) organized the Junior Personnel Officer examination on 10th February 2019. The examination has been conducted in many examination centers across the state of Telangana. The organization conducted examination for a huge number of competitors applied for the JPO Posts in TSNPDCL. Soon after organizing the JPO examination, the organization has made accessible of the answer keys. Candidates competed for the written test round can check the answer keys from the official website of TSNPSCL, Tsnpdcl.in. By downloading the question paper solutions, candidates can analyze the score by comparing with the answers given in it. Candidates can wait for few more days to download TSNPDCL JPO result 2019. Soon, the organization will announce the result date on its official website. Aspirants can stay checking the TSNPDCL website on a frequent basis for the latest updates. Telangana State Northern Power Distribution Company Limited (TSNPDCL) is the state level electricity board that works for power supply related operations in Telangana. The authority issues various recruitment notifications every year to hire suitable personnel in various jobs. TSNPDCL has recently issued a notification for 25 Junior Personnel Officer (JPO) posts and accepted applications from 28th December 2018 to 17th January 2019. Thousands of aspirants having suitable eligibility standards have applied for TSNPDCL jobs during the application dates. While the TSNPDCL is going to shortlist the suitable aspirants on the basis of their merit in written test and interview rounds. Candidates have to qualify the selection rounds with good merit to own the TSNPDCL JPO posts. Competitors who have given the selection test on 10th February can stay checking the TSNPDCL website, tsnpdcl.in consistently to check the updates regarding the result. The result is likely to release in March [Tentatively]. Usually, the TSNPDCL will release the result within 3 to 4 weeks after the exam date. Hence the result is anticipated to release in the 1st half of March. Hence stay patient until the result date is announced by the organization. As mentioned earlier, merit candidates will be given the top priority in selection. Hopefuls scoring the qualifying marks/cutoff marks in the exam will be mentioned in the merit list. For candidates mentioned in the merit list, the organization will conduct the interview round. The cutoff marks/qualifying marks will be announced along with results. TSNPDCL JPO Category-wise cutoff marks 2019 will be unveiled. Hopefuls have to score more than the announced cutoff marks to clear the written test round and to get shortlist for the interview round. Candidates competed for TSNPDCL posts can visit the official website, tsnpdcl.in to check the result, cutoff marks, and merit list. Hopefuls need to visit TSNPDCL website, tsnpdcl.in at the first step. On the homepage, ‘Junior Personnel Officer result 2019’ link will appear.